Palmer pigweed pops up in a soybean field. Trials at our Grow More Experience site in Kinston, NC, demonstrate just how important it is to control weeds early in corn, soybeans and cotton. Palmer pigweed was present in many of the soybean herbicide trials. It’s a common, competitive weed that emerges in the summer and can reach heights of 6 – 8’. Palmer pigweed can grow 2 – 3’ in a day, making it crucial to scout often for this weed to keep it from taking over your fields. Some states have reported up to 79% yield loss in soybeans when Palmer pigweed is not properly managed. Common lambsquarters was also spotted in the soybean herbicide trials. Lambsquarters is a competitive, summer annual weed that can grow up to 3’ tall and is capable of producing thousands of seeds per plant. Its leaves are light green, rounded-triangular in shape, and can grow up to 10” long. Lambsquarters can cause 25% yield loss with less than 1 plant per foot of row, so it’s important to get control of this weed early. 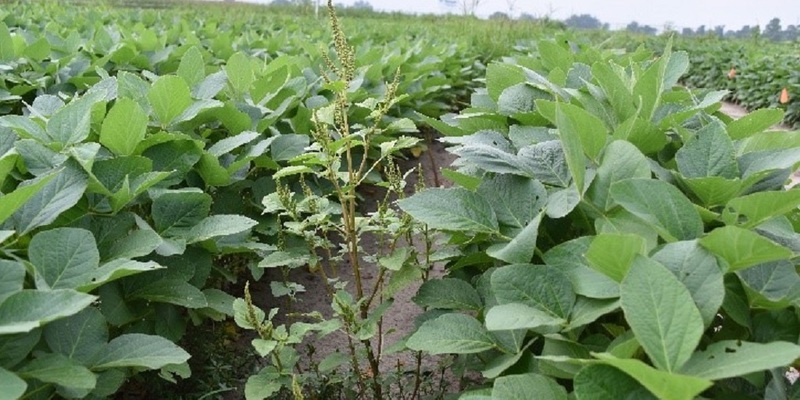 For effective control of Palmer pigweed, common lambsquarters and other broadleaf soybean weeds, we recommend Boundary® 6.5 EC herbicide or BroadAxe® XC herbicide for pre-emergence control, followed by Flexstar® GT 3.5 herbicide for post-emergence control. The soybean trials that were treated with these herbicides showed the cleanest rows and greatest burndown. These herbicides will protect your soybeans from competitive weeds, allowing them the chance to reach their yield potential. Contact your Syngenta representative to visit a Grow More Experience site near you. For future updates from our Kinston Grow More Experience site, sign up for the Know More, Grow More Digest to receive twice-monthly agronomic email updates pertinent to your area. All photos are either property of Syngenta or are used with permission.